Water is one of the important volatile components of the Earth, and the existence in the Earth’s interior influences the magma genesis. Our target is to understand the magma activity in the Earth’s interior through the understanding of the structure and physical properties of the water-bearing magma. The members of magma group have been studying 1) the generation of magma in the Earth’s interior, 2) the generation of hydrous phase under high pressure, 3) the element partitioning between magma and crystal, 4) the effect of water on high pressure phase transformation in mantle materials, 5) the structure of magma with and without water, and 6) physical properties (density and viscosity, etc) of magma, etc. by quenched (recovered) and/or in situ X-ray experiments using high pressure apparatus so far. 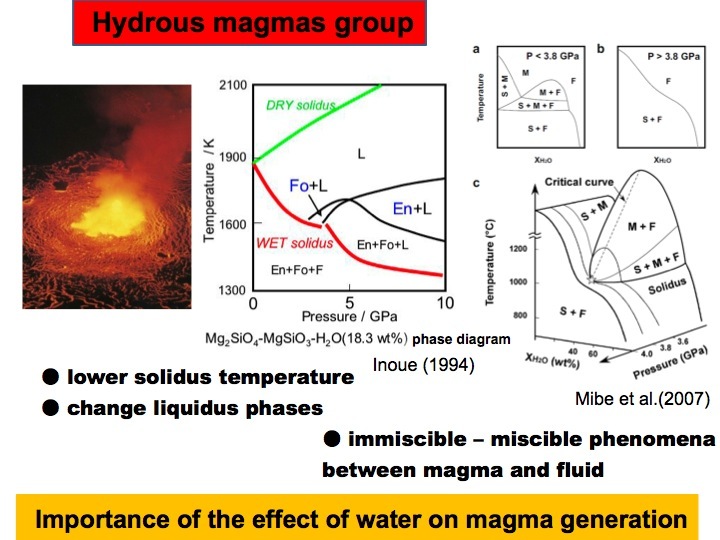 However, the researches only by these methods are insufficient to understand the structure and physical properties of water bearing magma, because it is impossible to detect the hydrogen atom by these methods. Our newly installed high pressure and high temperature device with neutron source enables us to conduct the neutron scattering experiment under high pressure and temperature, and to detect the behavior of hydrogen atom under high pressure and temperature. Moreover, the neutron scattering technique is superior to the research for magma structure, because it is possible to obtain higher Q scattered data compared with an X-ray scattering. Our research purpose is to clarify the effect of water on the physical properties and the structure of magma under the high pressure by using neutron, and to establish a newly neutron magma science under high pressure. Our group will clarify the structure change of magma and molten iron in various pressure, temperature and composition range by using the neutron in J-PARC, and by comparing the various physical properties, our group will clarify the role of magma and molten iron during the Earth’s evolution. Especially, the clarification of the effect of water and/or hydrogen on the physical properties and structure of the magma and molten iron will be strongly promoted, and the neutron magma science under high pressure will be established. The structure of the water bearing magma will be clarified by neutron scattering method. 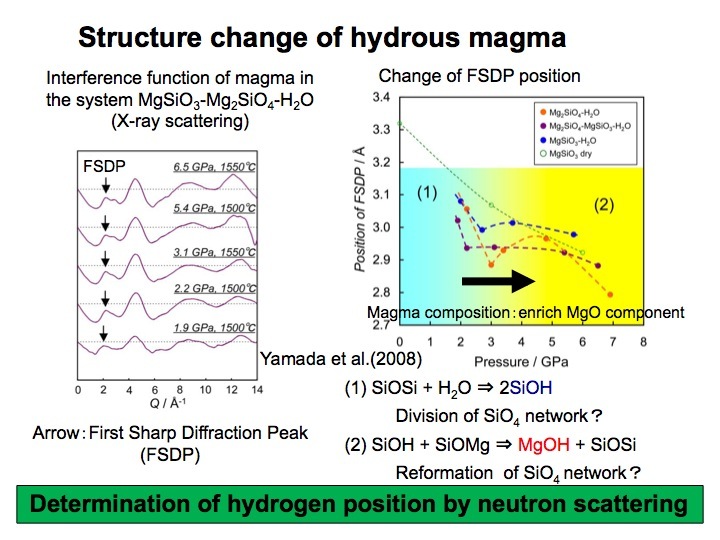 The composition of hydrous magma changes drastically with increasing pressure from SiO2-rich to MgO-rich composition. One of our targets will be to clarify this phenomenon from structure point of view. The viscosity and density of magma are important physical properties to understand the movement of the magma in the Earth’s interior. One of our targets is to clarify these physical properties by falling sphere method with neutron imaging. In low pressure condition, the silicate component bearing liquid and water bearing fluid can be distinguished by the existence of the immiscible region (two liquid region), and hydrous solidus can define clearly. In higher pressure, however, the immiscible region should be disappeared to form miscible region. 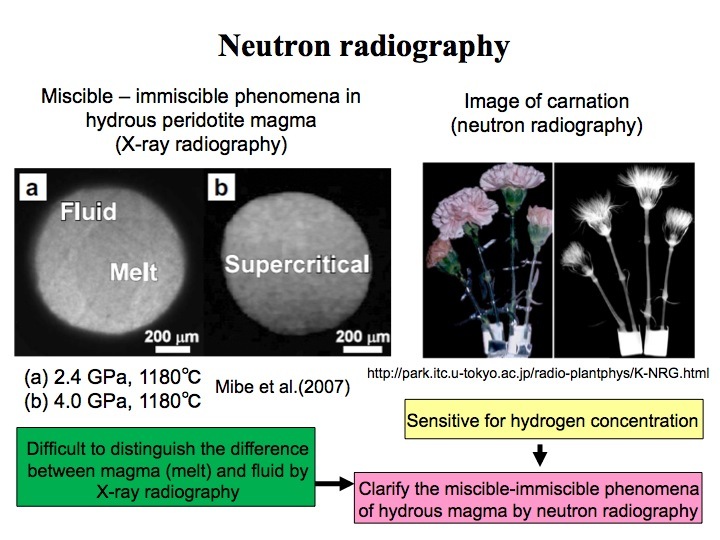 One of our targets is to clarify this phenomenon in various hydrous magmas by neutron imaging method.